I recently moved flats for the fourth time in two years. The new flat is much bigger, there is an actual bedroom and a balcony (on which I now have two lavender plants growing). But the kitchen is smaller and dysfunctional. It’s obviously not meant for someone who needs work space. But it’s okay. I can’t get the one cupboard to close because the frying pan is too big and there isn’t anywhere else to put it (or all the other things like bowls and cake tins I’ve accumulated) but I am taking deep breaths and ignoring it. I broke in the new oven with a cinnamon buttermilk cake and some strawberry jam. The new kitchen. At least the sink is a decent size. We had a glut of redcurrants on the allotment this summer. No one was entirely sure what to do with them but I had an idea you could put them into jam. I did some scouting on the internet (because none of my books had a recipe that was useful) and between Poires au Chocolat, The Guardian Word of Mouth Blog, and Darina Allen, I worked out a recipe. In the end I just used the redcurrant juice, smashing the redcurrants through a sieve. It seemed a good enough way to use them up. The jam is wonderful, strawberry and sweet, invoking the smell of high summer. Place some side plates into a freezer. Wash and rinse 9 340g jam jars and their lids. (I save all the honey jars for this. And my jar sizes ranged from 300g to 450g so 9 is a guesstimate.) Place on an oven tray and sterilise in the oven (oven at about 100C). They can remain in the oven til you need to use them. 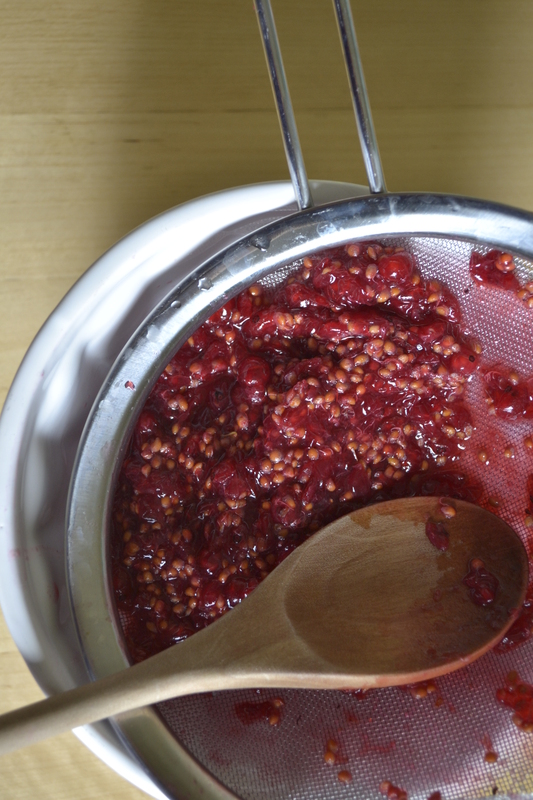 Smash the redcurrants through a sieve into a bowl. Reserve the juice, compost the skins and seeds. Place the strawberries in a large jam pot and smash them slightly with a potato masher – leave some whole and some smashed. Then add in the redcurrant juice, sugars, pectin and juice of the lemon. 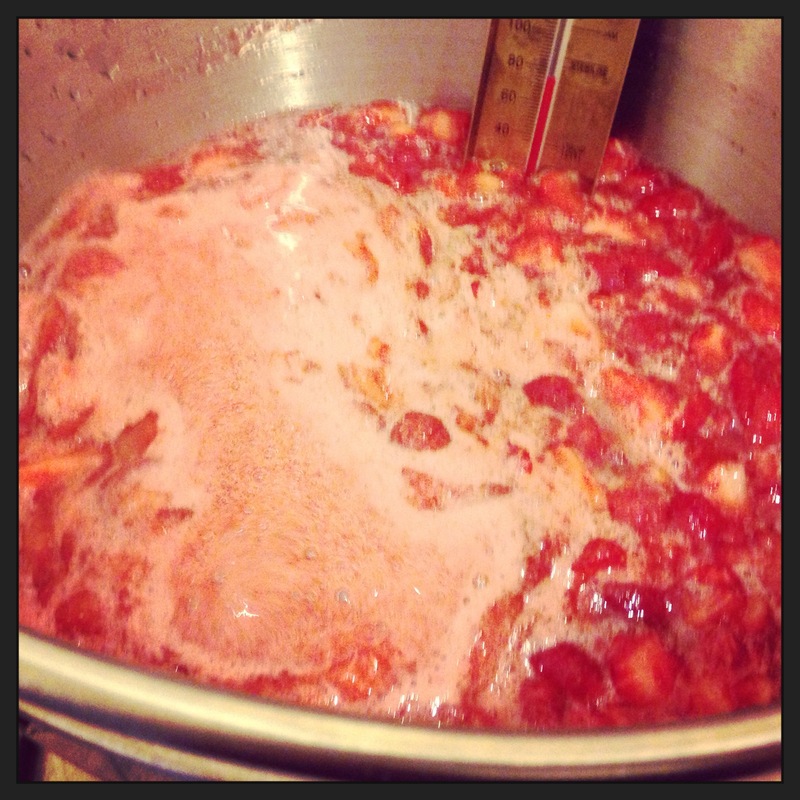 Bring to a rolling boil and boil until it reaches 104C – jam stage on a sugar thermometer. This can take anywhere from 5 until 15 minutes. Skim some of the scum off the top. Then place some onto a frozen plate and return to the freezer for a few minutes. Move your one finger along the jam on the plate – if it crinkles slightly and doesn’t run excessively it is done. Spoon into sterilised jars whilst still warm, using a funnel to keep the jars clean. Seal with wax paper circles and lids. Eat on toast, crumpets, pancakes or in yoghurt. *I only used the pectin sachets because I couldn’t find jam sugar anywhere. Feel free to use jam sugar and no extra pectin. The new view from my flat.